I spend a lot of time shooting lasers at trees, but this is definitely not as exciting as it sounds! These aren’t Han Solo style blasters we’re talking about, rather I’m talking about Terrestrial Laser Scanners. This is an instrument that shoots out millions of laser pulses and records the amount of time that elapses between the initial pulse and its return to the sensor after it strikes an object. In reality, rather than running around blasting things, the work mostly involves me sitting next to the instrument making sure that I’m not blocking the laser and ending up in the scan myself (see photo 1). 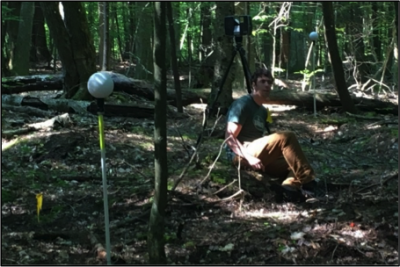 Using this instrument we determine the distance of objects from the scanner and make 3D maps of the surface of just about any object – including the canopy of a forest. You may be thinking, “Why would you spend time doing that?” Well, I’m glad you asked! Let me tell you a bit about how important canopy structure is in a forest. Forest canopy structure can mean a lot of different things. Often scientists are interested in the total quantity of leaf area in a forest, because those leaves are the photosynthetic system of the trees and thus determine how much they grow and how much carbon they pull out of the atmosphere. This is usually described as Leaf Area Index – which is the amount of leaf area per unit ground area. Because it would be pretty time-consuming to go out and cut down all the leaves and measure their total area, this aspect of forest canopy is usually estimated either by collecting leaves in “litter traps” (of a known area) as they fall off the trees or using hemispherical (or “fish-eye”) photographs pointed up to look at the canopy (see photo 2). Another way of thinking about canopy structure is in terms of the arrangement of leaves and branches in the canopy in 3D. Knowing how these canopy elements are arranged can tell us a lot about how the forest will function and the values that the forest can provide to ecosystems and human society. The legendary ecologist Robert MacArthur was one of the first scientists to delve into this topic. He created a metric he called “Foliage Height Diversity” – basically the vertical stratification of canopy elements. His research showed that this feature of a forest was very strongly related to the habitat value of the forest for birds and that different bird species used forests with different types of canopy structures (e.g., dense subcanopy vs. tall canopy and open subcanopy) due to needs for nesting, foraging, hunting, etc. Work by my lab and a number of collaborators has illustrated that the 3D structure of the canopy is also very important in how productive forests are and, thus, how much carbon they are able to remove from the atmosphere. We currently have funding from the National Science Foundation and US Department of Agriculture to assess the generality of this finding across the eastern US in a range of forest types and with different management strategies. How does this relate to Stormwise and the resilience of forests to disturbance? Although the effects that canopy structure has on habitat use and C uptake is obviously important, this feature of forests is also a major concern as we attempt to understand how to make forests more resilient to disturbance. The natural disturbances that cause damage to forests (and adjacent infrastructure) are generally associated with either high winds or ice/snow accumulation on branches. The potential for both of these types of disturbances to cause damage or result in tree or branch failures is strongly related to the structure of tree crowns and forest canopy. For example, the movement of wind over and through a forest stand, and it’s propensity for damaging branches or trees, can be strongly related to the structure of the canopy, both in terms of the smoothness vs. roughness of the canopy exterior and the interior structure of the canopy and how it creates turbulence within the canopy. We are endeavoring to better understand these relationships by pairing measurements of the movement of trees with mapping of all of the canopy elements in a forest stand (photo 3), both before and after Stormwise-related management activities. Also, the structure of the trees and branches in a forest could have a very strong impact on the potential for ice/snow related branch and tree failures. We are collaborating on an NSF-funded experimental ice storm project being conducted in New Hampshire at the Hubbard Brook Experimental Forest (http://www.hubbardbrook.org/research/climate/Rustad_12.shtml), to attempt to better understand both how ice storms affect canopy structure and also how different types of canopies (with different initial structure) might be affected by ice storms. 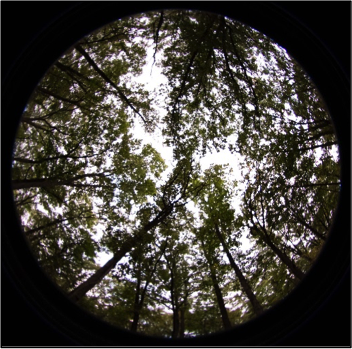 Through the studies we hope to both understand how canopy structure affects the resilience of trees and forests to disturbance and use that scientific understanding to more effectively manage forests to promote resilience. 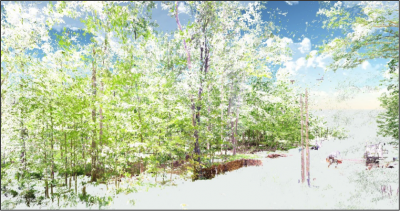 3D model of UConn Stormwise research site developed using terrestrial laser scanner.